Welcome to the Family Store. Your purchases here support the free content on this website. Everything here is high-quality, family-friendly and available only from FamilyGorilla. Please read our Payment & Shipping Policies before completing your order. 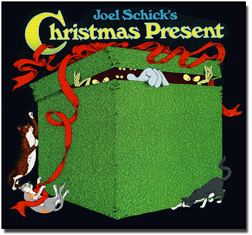 Four classic black-and-white cartoon plays performed by the Doggy Dramas Repertory Company, in two handy-sized (6" x 6") books. 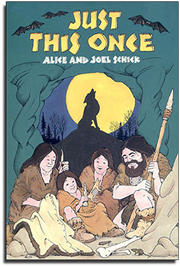 Autographed by Alice and Joel Schick. The Blue Book: The Maltese Maltese flips over to Snow Ruff and the Seven Dwarfs. The Green Book: The Bone Ranger flips over to A.G. The Alien Guy. Click on any book cover to see a sample page from each play. Did you ever wonder how the dog came to be man's best friend? Just This Once tells the story of how it might have happened. The "engaging, easy-to-read text" and "delightful, detailed illustrations" make Just This Once a perfect read-aloud treat. Click on the book cover to see a sample page. Move over, Rudolph; step aside, Grinch. 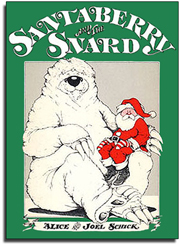 Make room for the most lovable, laughable Christmas character everthe Snard. This tale of Santa Claus' first encounter with a rare inhabitant of the Far North is guaranteed to become a holiday read-aloud tradition. Everyone knows what comes on the first day of Christmas. But what if something strange showed up on the second day? And the third day? And. . .